Cameron Sargent (15) and Sophie Ravenscroft (8) both returned from the Inclusive Skating International Figure Skating Competition in Glasgow with medals around their necks! 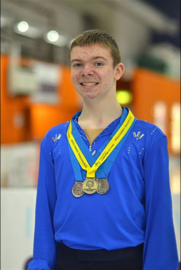 Following on from International Figure Skating success in Finland in December in a Special Olympics International Open, Cameron entered the Inclusive Skating Ice Dance Competition for the first time, as well as the Figure Competition. It meant a busy schedule over two days of competition and four costume changes, which had to be managed carefully for Cameron who has Autism and a Learning Disability. But it was worth the effort! After moving up a level and skating to music from “Rocky” Cameron was delighted to receive silver medals for his figure events, and absolutely thrilled to receive silver for his ice dance performance. 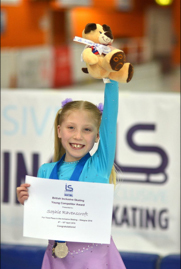 For Sophie, Glasgow was only her second competition after starting to skate at Cannock Silver Blades in September 2014. Sophie’s medical conditions meant she too qualified for the Inclusive Skating Competition and she entered the figure competition at level 1. After lots of training, a very sparkly new dress and huge amounts of effort and enthusiasm, Sophie thrilled the audience with her cute smile and lovely skating, to the theme from Monsters Inc. And all were thrilled with Sophie’s results, achieving two silver medals. At the same event, Glasgow also hosted the Special Olympics National Figure Skating Competition for those British skaters with Learning Disabilities. Cameron entered, again at level 3, and won Gold in the Men’s Advanced Novice category, making two consecutive National Special Olympic gold medals. This renders Cameron eligible once again for selection for the Special Olympics Great Britain team at International level and took his tally from Glasgow to four silver medals and one Gold. Cameron and Sophie are both shining examples of British disability skating and Silver Blades is delighted to offer their congratulations to them both. Here’s looking to the future!